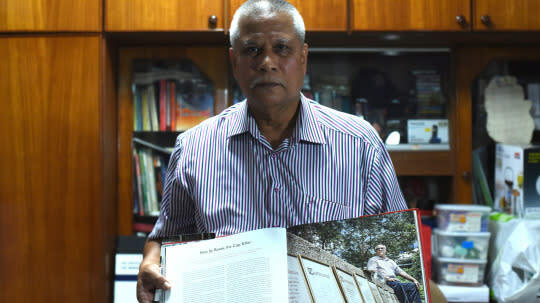 A Yahoo Singapore exclusive by Nicholas Yong and Safhras Khan This is the second of a three-part series to mark the 30th anniversary of the Hotel New World disaster. Read part I and part III. Some were members of the rescue services. Others were expatriates called upon for their unique expertise. Still others were volunteers who lent a hand simply because they could. 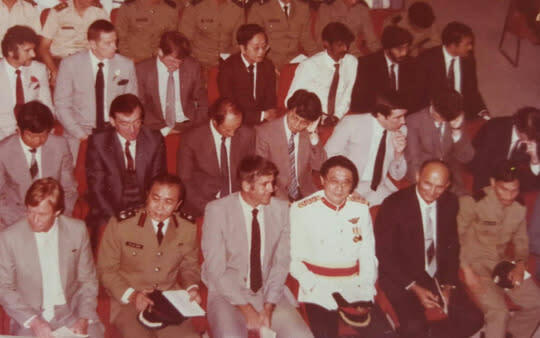 All of them played a part in the rescue of 17 people from the ruins of Hotel New World, after it collapsed on Saturday, 15 March, 1986. Singer-songwriter Kelvin Tan, then 22, was a full-time National Serviceman in the final three months of his National Service. Tan went to the site with a friend over two evenings to volunteer their services. Some 500 rescue personnel from the Singapore Armed Forces, Singapore Civil Defense Force, the now-defunct Singapore Fire Service and the Singapore Police Force were eventually mobilised. 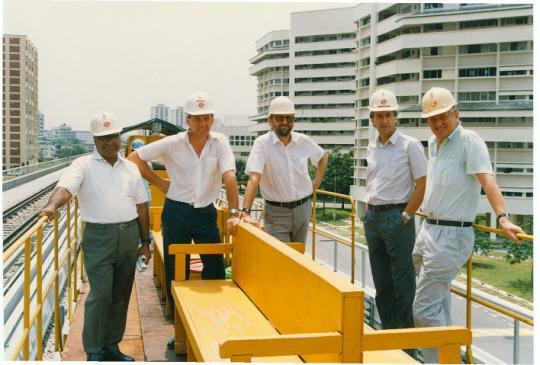 Briton Tony Burchell, then 36, was a senior resident engineer with the Mass Rapid Transit Corporation, the predecessor to Singapore Mass Rapid Transit (SMRT). Burchell and fellow engineer David Stewart mobilised a team of some 30 tunneling experts, including Michael Scott, who had been working on the MRT line. “Not one man refused,” said Stewart, also a Briton. They spent up to 15 hours on site each day, constructing four tunnels into the debris in search of survivors. At any moment, the wreckage could have caved in and crushed them. “Sometimes, it was trial and error”. On Sunday morning, at a ventilation duct that led into the car park, a member of Stewart’s team heard what sounded like a voice. He then asked for all of the equipment on site to be switched off. This sparked the start of an effort to try and break into the wreckage at ground level in a bid to rescue Angelia. Tunnel shift foreman Michael Scott spent many hours following the sound of her voice. “I just kept talking to her to try and reassure her that we were going to get her out,” he said. “You couldn’t use tools, because the car park was full of cars which had been squashed. There was a smell of fuel,” said Scott. Sparks from the tools could have caused a fire. There were also many obstacles in the way, from jagged steel to reinforcement bars, while the tunnels had to be reinforced with wooden beams. Suddenly, movement in the debris led to rescue personnel being evacuated from the tunnels. They waited an hour before they were allowed to go back in. But by the time the rescuers reached Angelia, it was too late. 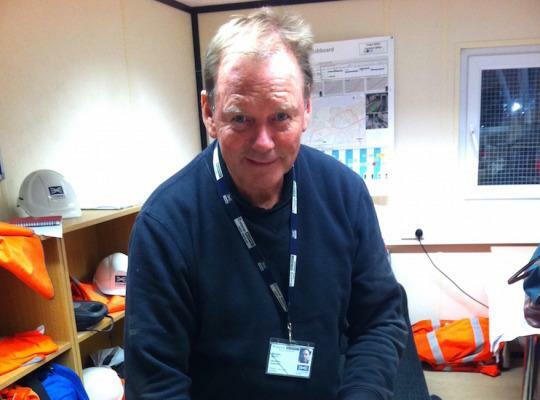 Tunneling expert Brian Power, whom Burchell remembers as a “hard man”, struggled to accept it. “I had never seen him cry before,” said Burchell quietly. The grisly task of accounting for the dead fell to Khan and his team. Part of his duties included accompanying the next-of-kin to identify the 33 bodies that were recovered. Retired tunnelling expert Michael Scott. Photo courtesy of Michael Scott. 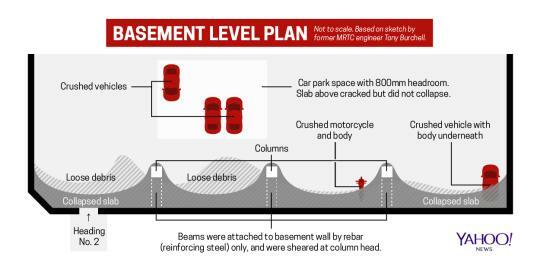 Scott and SCDF personnel were able to break into the ground floor bank, where they discovered the grisly remains of a security guard – and a young man who was still alive. His foot was pinned down by a filing cabinet. As rescuers lit up the area, the survivor saw the nearby body and went into “panic mode”, said Scott. The body was moved out of the way after several hours, but the young man did not calm down. Scott said, “Every time we tried to pull him out, he was screaming like a banshee. It was frightening, I tell you.” This went on for about an hour. At his wits’ end, Scott requested a hacksaw in a bid to scare him. “I told him: you either keep quiet, or I’m going to cut your leg off.” Eventually, the man’s leg was freed, and he did not make a sound – although he became “hysterical” when rescuers could not retrieve his shoe. “I went to see him in hospital later. He was still in shock, poor man. He didn’t even recognise us,” said Scott. On Wednesday afternoon, rescue operations were called off when it became clear that there were no more survivors. But after the rescue, Scott was haunted by the “awful smell” of death. Despite having a good bath with two bottles of Dettol, the smell lingered “for weeks”. It took five years before he fully got over the experience. A total of 94 individuals and 33 organisations involved in the rescue operations were given national awards by then-President Wee Kim Wee. They included Michael Scott, and Ramlan Dollah, a standby fireman on the day who volunteered his services. “It was my duty. I am not a hero. I was just carrying out my duty as a fireman, to save life and protect property,” said Ramlan. “He got out, and he told everyone on the bus who I was. People began to recognise me, because we’d been on TV. And I swear to God, we never moved for 20 minutes. There was pandemonium in the bus,” said Scott with a laugh. Like Scott, Burchell also received many “little thank-you notes” from schoolchildren and adults alike. “I was amazed how the people of Singapore were so appreciative,” he said. 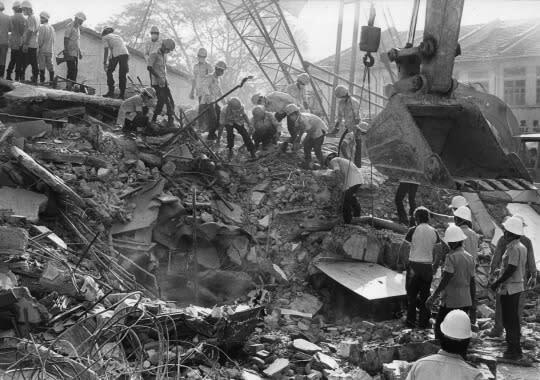 This is the second of a three-part series to mark the 30th anniversary of the Hotel New World disaster. Look out for part III on Tues, Mar 15. You can also read part I and part III.